Payal Singhvi conversion case has once again brought Rajasthan’s anti-conversion bill under the spotlight. 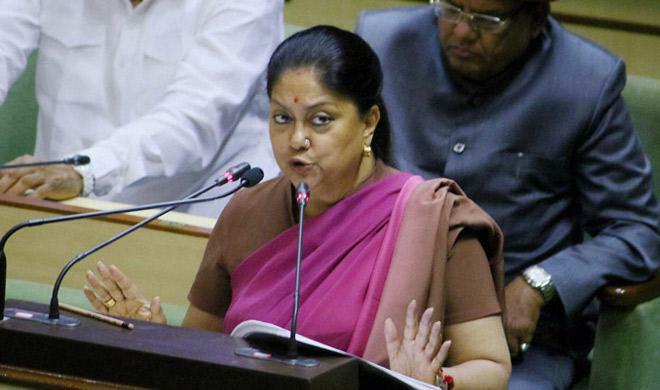 ‘Unconstitutional’ remark over “Rajasthan Dharma Swatantraya Bill,” as the centre’s response invited by Vasundhara Raje Govt, yet upholds the clearance of bill difficult and further, an onus to the Govt to be blamed if it now gets the signature from the President Kovind. 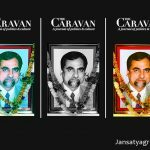 Rajasthan’s anti-conversion bill or “Rajasthan Dharma Swatantraya Bill” is in the limelight these days, especially, since Payal Singhvi case hearing started in the Rajasthan High Court during November. The honorable court pointed out that simple affidavit on Rs. 10 worth of stamp paper does not seem to be enough when it comes to changing religion. The court also asked the state government if it has any law for religious conversion. The HC suggested that there should be a proper procedure when it comes to converting from one religion to the other. While sharing its opinion on the matter, the government informed the court that its anti-conversion bill is pending for approval by the central government. As per the bill, to change religion, the concerned person would have to seek permission from the collector at least 30 days in advance. The officials would verify the background of the case and then issue permission for conversion. Forcing or tempting (influencing) someone to convert may attract a fine of Rs. 25,000 as well as three years of prison term. The law also makes reconversion (returning to one’s forefathers’ religion) very easy. In case if someone tries to influence a woman, minor, or individual belonging to the SC-ST community, he or she can face five years in prison as well as a fine of Rs. 50,000 as per the bill. Once turned into law, the state government would also have the power to cancel the registration of organizations involved in illegal religious conversions. What’s the need for such law? Just imagine. How would the American Government react if an Indian organization establishes an office in the United States and starts offering money to people who convert from Christianity to Hinduism? Won’t they show any resistance? Today, no one can deny that there’s a well-oiled racket run by missionaries to convert people into Christians. We are also looking at several possible Love-Jihad cases. Such outfits operate in various parts of India. Even the Supreme Court has recently pointed out that human mind is gullible and can be influenced, manipulated to commit suicide, like in the Blue Whale Challenge game. There are several cases in which the courts have asked the state government to form a policy for conversion. Thus, such law is the need of the hour. It would make illegal conversions a non-bailable offense. 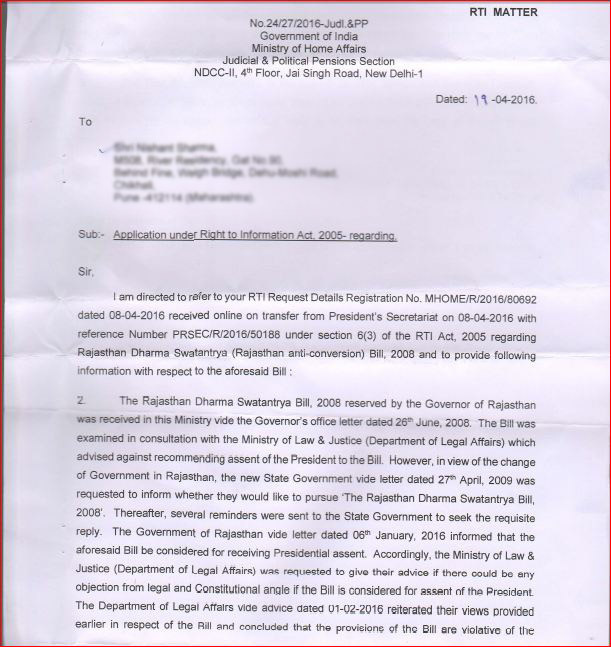 The reply of Ministry of Law and Justice on an RTI filed by Jan-Satyagrah team member. 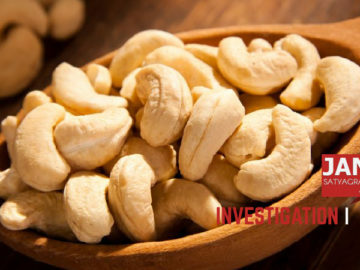 The first version of the bill was passed in the Rajasthan Assembly in April 2006 and was immediately sent back to the cabinet by former President Pratibha Patil who was governor of Rajasthan in 2006. Another version of the bill was passed in the state assembly during March 2008. This version was pending with the central home ministry for several years before sending to President signature. It was returned to the state government for further clarifications on some points marked as Unconstitutional. Though these were invited by the state government only, after knowing that the centre was being ruled by UPA government then. Getting the bill cleared from the central ministry of home affairs before sending it to the President is essential to make sure that the law’s principles are in line with central government’s requirements. So, perhaps, the state would have to change certain clauses and resend the same. Who’s opposing it and why? 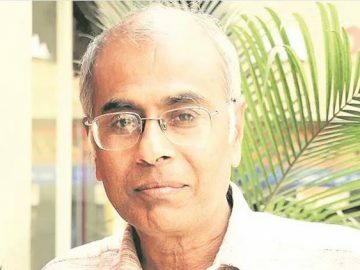 It’s not rocket science; the All India Christian Council, Emmanuel Mission International (EMI) and Christian Legal Association of India along with Dr. John Dayal were the first ones to oppose the draft. These Christian outfits have support from the Congress, CPI (M), as well as left-liberal intellectuals. Most of them associated with foreign missionaries claimed that the bill violets Indian Constitution’s Article 14. They believe it may act as a tool to harass Christians. 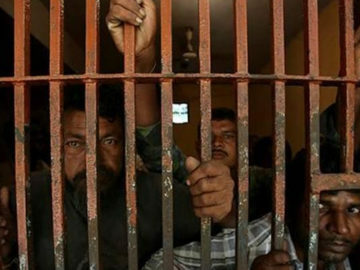 In 2008, while supporting the need for the law, the then Social Welfare Minister of Rajasthan, Madan Dilawar had shared his opinion that there are groups which operate in the state’s tribal regions as well as in areas where poor Dalits reside. The individuals from these groups threat or bribe people to change their religion. Gulab Chand Kataria was the state’s home minister during those days. He pointed out that the new law would play an essential role in stopping Christian missionaries from illegally converting people, especially, in parts of Kota. Is the state administration itself “unwilling” to get the bill cleared from the center? Currently, the BJP is in power in Rajasthan as well as at the center. So, it won’t have any issues in getting the bill cleared by the President of India as well. But, only if chief minister Vasundhara Raje is REALLY willing to do so. Jan-Satyagrah is following up the matter since a long back. The RTI filed in 2016 by one of our team members shows the matter has been pursued a delay-dallying manner by state governments. He shared his opinion on this long-pending issue. “The state government’s approach seems to be dicey. They have their battery of lawyers. Plus, Raje can also seek advice from the AGI and the Advocate General of the state to make sure that the bill does not become unconstitutional. In spite of all this, the draft was recently sent back to the state government by the center with comments from center’s department of legal affairs. 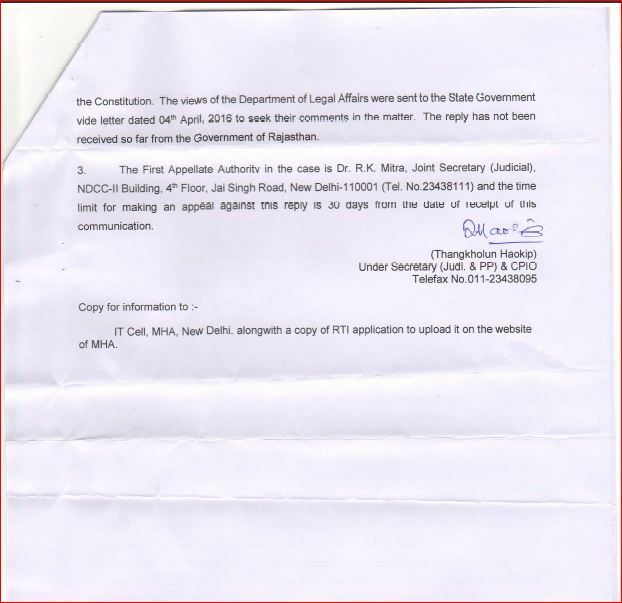 The Depart of Legal Affairs via home ministry reverted to my RTI suggesting the same. The act can play a vital role in stopping Christian missionaries as well as love jihad. I can’t understand why they are acting like a schoolboy who has lost his way while returning home. 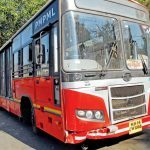 Though the state government is working on observations cited as unconstitutional in the clauses of the draft, but it will be quite difficult to justify the government politically if the bill gets signed from the president,” expressed by our team member. Rajasthan is set to witness assembly elections during 2018. Now, the question is- will Raje modify the bill, send it to the center for clearance, and convert it into law with President’s nod?